The Buford Corn Maze is planning to expand for the 2016 season. Read more in the Gainesville Times’ cover story! 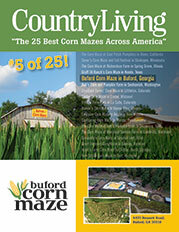 Several editions of The Patch.com in Gwinnett County included the opening of the Buford Corn Maze! We're located at the intersection of Friendship Rd. and Ridge Rd/Hog Mountain Rd! *All tickets include access to Kid's CORNer play area and activities, unlimited hayrides & more! No pets allowed. Service dogs permitted.